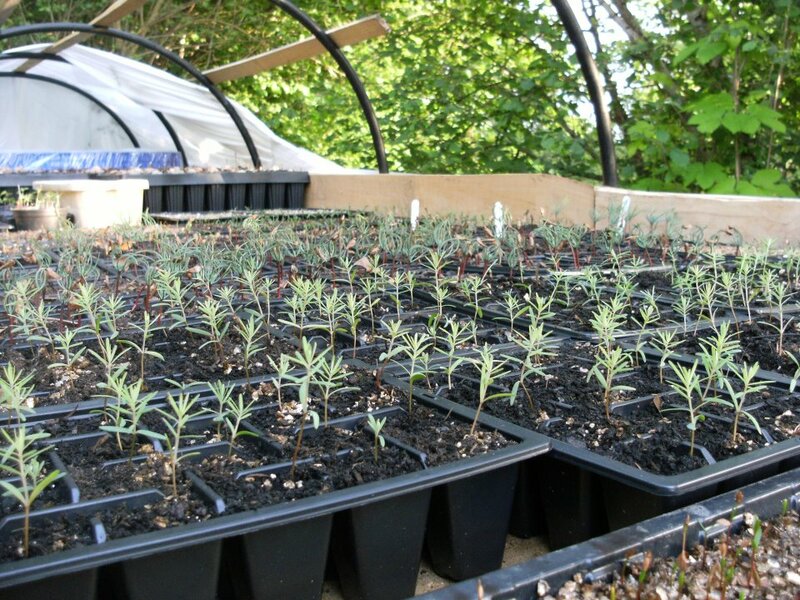 Having only once before attempted to grow this rather temperamental species I thought that as I am selling this seed I need to know how well it performs in real growing conditions rather than quoting laboratory germination result statistics. The seeds were placed in a ziplock freezer bag, the bag was then filled with enough ordinary cold tap water (with no sterilisation) to immerse the seeds. The bag was then sat on a shelf at room temperature for approximatly 24 hours. 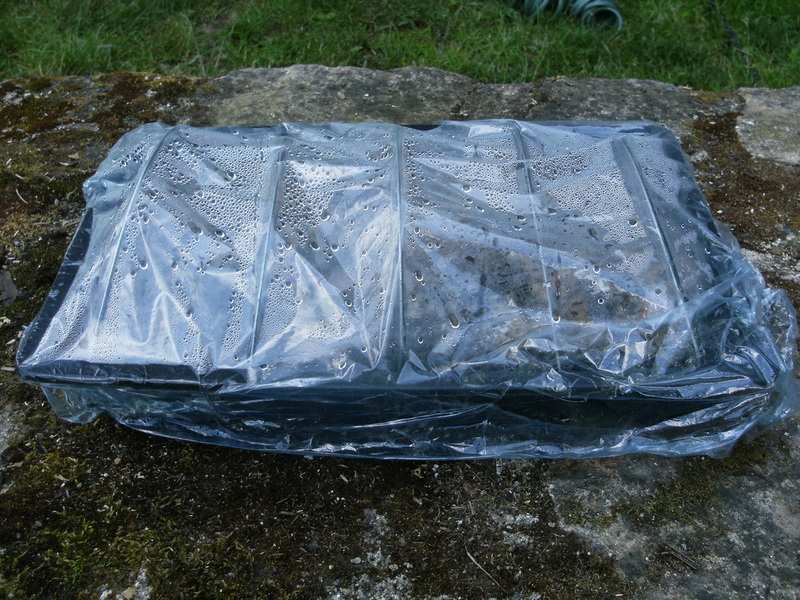 I then hung the bag up in an outbuilding using a bulldog clip and pierced several times at the base to allow the water to escape. I then gently squeezed out the remaining water with my hand and placed the bag in the fridge. This process is known as naked prechilling. Expecting a delay of at least 4 weeks until any signs of root emergence I was greatly surprised to see lots of seeds with small white roots after only 15 days. I removed the germinating seeds individually with tweezers and placed them 1 seeds per cell into plug trays. The remaining unsprouted seed was returned to the fridge. I check the bag every 4/5 days, I have found that new seeds are continually germinating which I remove from the bag for planting in cell trays. I'll just let the seeds in the plug trays develop for a few more days and I'll upload a photo. 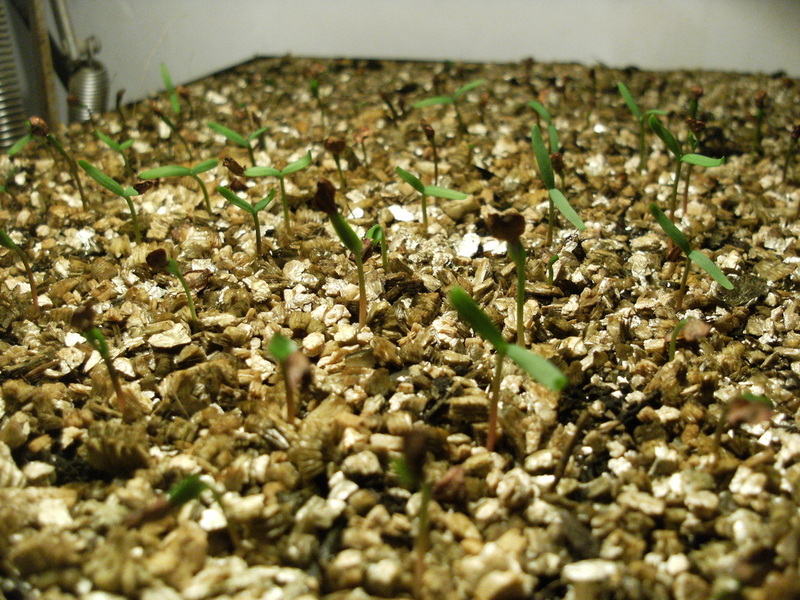 The same seedlings at 6 weeks just after having been moved into bigger growing cells. I had the chance to collect a few more cones from a fairly young Deodar Cedar tree that is already begining to bear quite large numbers of cones. In contrast to the Blue Atlantic Cedar cones that I had collected the day before, these were already begining to break up. I had to take care to stop them falling apart before I could place them in my collecting bag. It didn't take me long after my return home to start opening up the cones to extract the seed. Unfortunatly most of the seeds contained within the cones were empty. However within each cone were around 15-20 good seeds of around about 50% were already germinating within the cone. Some of the root radicles were at least 5mm long and required considerable care to extract them without breakage. 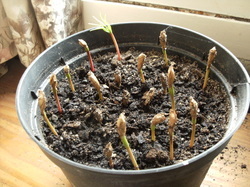 This was a real surprise and I have sown the germinated seeds immediatly to give them the best chance of survival. 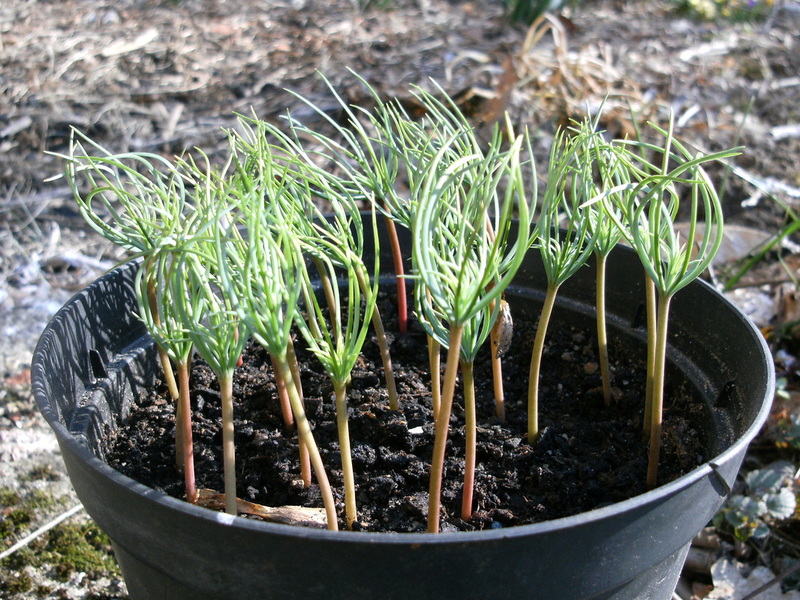 The seeds have been able to germinate because the loosening of the cone scales prior to natural seed dispersal has allowed rainwater to get inside. This followed by our recent mild weather has allowed germination to occur.